So November is in full swing, John Lewis have shown their much anticipated advert and Oxford Street have already put their Christmas lights up. Since everyone has started to prepare for the madness that ensues for the run up to Christmas, I thought I’d get you started a little early this year and make life just a little bit easier for you. Everyone loves a personalised gift. 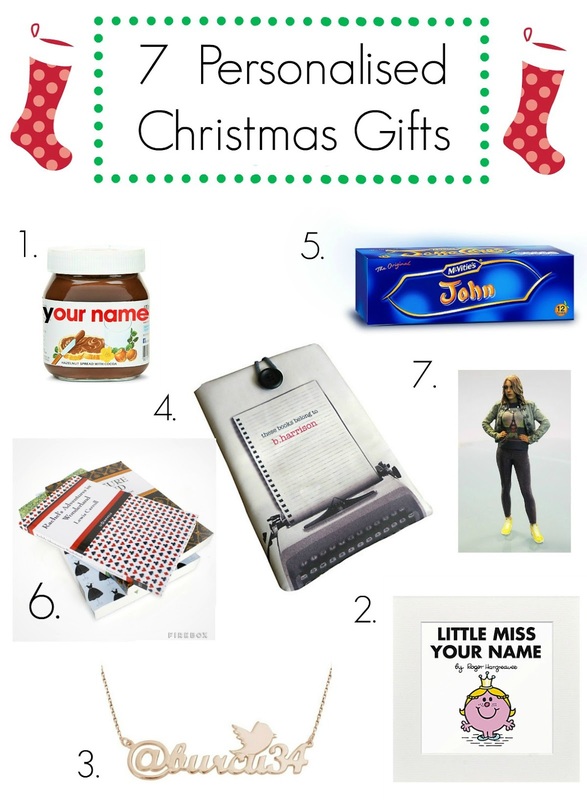 There’s something about having a crappy pencil with your name on it and if you were one of those that never found your name on things like said crappy pencil’s your about to love this Christmas gift guide of perfect personalised gifts for all the family. 1. Nutella – Yep, it’s back again this year! You can either pop into Selfridges if you’re near one and have it done there on the spot or you can now order it online here. I don’t know a single person who doesn’t love the taste of Nutella, and having your name put on it just makes it seem just that much more special when you’re sat digging your fingers straight into the jar. 2. Mr men and Little Miss prints – If you’re of a certain age, Roger Hargreaves books will have been a prominent part of your childhood. I missed out last year on having my very own little Miss Rosie mug and was absolutely thrilled to hear that they will be doing these again this year. Head to your local Selfridges store to find out more. 3. Twitter Handle Necklace – Yes these exist and yes I really want one! Having your actual name on your necklace is sooo last decade. Everyone needs one of these. A quick Etsy search will bring up a list of stores that hand make them for you. 4. Kindle Covers – For the avid reader, I’m loving this personalised kindle cover. Pro tip: It fits an Ipad mini/Nexus tablet inside too! Available at John Lewis here. The order system seems a little messy but I have every faith in John Lewis, and I’m sure they’d make it as fuss free for you as possible. 5. Jaffa Cakes – Full moon, half moon, total personalisation! If you know someone who is anything like me and can sit through a whole box in one sitting then you’ll want to head over here. 6. Classic Novels – Being the obsessed fan of Alice In Wonderland I am, the thought of having a personalised novel with my name on it makes me SO happy. Firebox are allowing customers to pick out of 8 different classic novels to have personalised. Find them here. 7. A Personalised 3D Figure – This one is by far the creepiest but also the most awesome, and definitely the most expensive of the lot. Asda are offering the chance for you to create a mini figurine of yourself or a loved one by using a 3D printer. Find your nearest participating store here.